Corps instructors and designers engage in discussion at the 2014 DCI Winter Business Meetings in Scottsdale, Ariz.
More than 150 members of the Drum Corps International community gathered just outside of Phoenix in Scottsdale, Ariz., Feb. 6-9, for the 2014 DCI Winter Business Meetings. 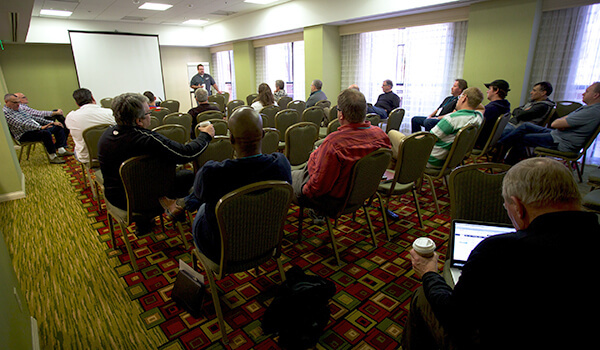 The largest annual off-season gathering of directors, instructors, adjudicators, drum majors, guest presenters and other representatives, the meetings are organized to assess the business of DCI, exchange best practices and discuss the educational and competitive aspects of DCI's World and Open Class corps. "Honestly, it has been years since I've left an annual meeting this exhausted, yet exhilarated," DCI Board of Directors Chairman and Santa Clara Vanguard CEO Jeff Fiedler said. "I'm not sure if it had anything to do with the warmer weather and sunlight, but everyone was ramped up and ready to get something done when they arrived, and that energy lasted throughout the weekend." The voting membership of Drum Corps International, made up of representatives of all 22 World Class corps convened Thursday, Feb. 6. Directors and representatives heard reports from various committees and sub-committees covering a broad scope of business operations and took votes on several rules and competitive issues. Executive Director and CEO Dan Acheson and Chief Financial Officer Wayne Leide provided a detailed report indicating that Drum Corps International realized its third most profitable year in history in 2013 as a result of strong ticket sales and business growth across many sanctioned tour events, the 2013 World Championships and other initiatives. "We're pleased with the continued growth trends in audience attendance and participation in the corps and our affiliated programs," Acheson said. "We achieved another record number viewing our 'Big, Loud & Live' broadcast in movie theaters this August, and attendance in the stadium at the 2013 World Championship Finals combined with those viewing our live webcast produced the largest audience for the season-culminating event since the 1981 Championships in Montreal." In other proceedings, DCI Hall of Fame member Michael Cesario was re-appointed by a unanimous vote of the membership to the position of Artistic Director. Cesario has held the role since 2010, serving as a liaison between the competing drum corps and adjudicators and assisting with the facilitation of the Rules and Systems Task Force which advises the organization on matters relating to competition and adjudication. Also by unanimous vote of the membership, eight individuals were elected to one-year terms to serve on the DCI Board of Directors. Overseeing the business affairs of the corporation will be Tom French (unaffiliated), John Masterson (Troopers), Chris Komnick (Madison Scouts), Jeff Fiedler (Santa Clara Vanguard), Fred Morrison (Crossmen), David Gibbs (Blue Devils), Jim Coates (Carolina Crown), Mark Arnold (Blue Knights) and Rick Valenzuela (Phantom Regiment). Appointed as officers, Fiedler will serve as Chairman, Komnick as Vice Chairman, Morrison as Treasurer and Valenzuela as Secretary. Previously approved for participation in the DCI World Class tour beginning in 2013, the Portland-based Oregon Crusaders were granted full voting membership effective as of the weekend's meetings. World Class voting membership status is awarded only after a screening process, which reviews and evaluates an organization's operational plan, financial wherewithal and general business health. Down the hall from the main voting membership meeting, Open Class directors were at work to drive their own progress and make news for 2014. With discussion centered on the growth and stability of the Open Class contingent of the larger collective of corps, directors spent time in professional development sessions and sharing best-practices for successfully managing their organizations. "We continue to refine the focus of the Open Class corps participating in Drum Corps International," Legends Executive Director and CEO Ibe Sodawalla said. "It is not simply a stepping stone to the World Class nor is it solely a place to begin participation within DCI. There are unique challenges and opportunities shared by the participants in this division, and we are committed to working together to serve our members at a higher level." During a joint session with their World Class counterparts, directors discussed the development of new DCI programs SoundSport® and DrumLine Battle?„?, each offering new opportunities for engagement as participants. For some, involvement in these new brand extensions will provide their programs with opportunities to develop the infrastructure for increased participation on future tours, if desired. Members of the Open Class are already seeing this happen. The Guardians, a Texas ensemble which organized during the summer of 2013 as one of DCI's inaugural SoundSport teams, is now undergoing evaluation by Drum Corps International and the Open Class Advisory Committee to compete on a portion of the 2014 DCI Tour as an Open Class corps. "This is the right type of growth we're seeing and promoting for these groups," Open Class Coordinator David Eddleman said. "We're looking at organizations made healthy by their participation in DCI activities who are cautiously taking steps to grow and expand within their organization's capabilities and resources." Representatives of other emerging Open Class corps were also in attendance including Eruption (Washington) and Golden Empire (California). Coastal Surge, a South Carolina corps that participated as an exhibition group last summer, also attended the meeting requesting competitive status and access to an extended regional tour in 2014. "The Open Class has a unified spirit and we have been making much progress as a division of DCI," said Sodawalla, who serves as the Open Class Advisory Committee Chair. "The energy in the room during the weekend was at a high level and we are further aligning ourselves with the DCI business plan as well as undergoing further planning specific to the unique needs of the Open Class corps." Open Class judging was a hot topic at this year's meetings, addressing issues that have arisen since DCI's current judging system was implemented in 2012. It was felt there was some confusion with performers and audience alike, mainly due to the way Open Class corps have been scored. Sodawalla points out that the judging sheets used for Open Class corps have been the exact same as those used for World Class units, with just a difference in how they were applied. One of the decisions to come out of the meeting brought forward by-, voted on and unanimously supported by the Open Class groups was the decision to utilize the same scoring system as the World Class units throughout the entire summer. Previously this was only the case starting with the World Championships in August. This change may result in lower scores than many are accustomed to seeing. Through this comparison, however, the corps staffs and members will hope to better understand how they stack up across the breadth of the competitive spectrum. Open Class corps will still be able to field performances at a minimum length of eight-and-a-half minutes (the World Class minimum time limit is 10 minutes), allowing those units to focus more time on fundamentals. If they so choose, they can utilize the lesser minimum show length without penalty. "We are working to make certain the corps receive accurate feedback and representation of where they fall on the scoring continuum according to the performance standard expected of all DCI corps," says Sodawalla. "The Open Class is working hard to break out of its stigma as being smaller and inexperienced corps," Sodawalla said. "We recognize that we do have differences and our spectrum of corps is diverse, however the responsibility to provide quality education to our students, expect a high level of excellence, and entertain our audiences is also the foundation to which all DCI units must contribute." Nearly 40 drum majors representing both World and Open Class corps were invited to Scottsdale for a leadership-focused weekend featuring guest presenters, educational sessions and plenty of time for networking and building lasting relationships among their peers. A program organized several years ago by Hall of Fame member Gene Monterastelli, Drum Corps International's drum major leadership summit is something that former Santa Clara Vanguard drum major Stephanie Lee-Grote never had an opportunity to attend during her years on the tour. Grote, a 2009 Jim Jones Leadership Award winner and now a Texas band director, was one of four former corps members invited to mentor small groups of this year's drum majors during the weekend. "During the summer, gathering for the drum major retreat at the end of a show was always a little bit awkward," Grote remembered. "It would take two or three shows to really start to form personal relationships with the drum majors from the other corps, and we rarely, if ever, contacted each other between events. Now, the DCI drum majors are introduced to each other in the middle of the winter camp season, and by the time the summer tour rolls around, some are already close friends." Drum majors strengthened those ties with each other by participating in a variety of workshops and in-depth discussions which covered everything from personal assessments and goal-setting, to developing strategies for making tough decisions, media training and conducting skills. "I plan on taking a lot of the different ideas presented to us and adapting them to fit the needs of my corps," second-year Crossmen Drum Major Caitlin Hall said. In her second year attending the workshop, Carolina Crown Drum Major Linda Harvey also found quite a few takeaways from the weekend. "We touched on a number of things that I wish I knew sooner than I did as a drum major and worked on skills that no one usually gets to teach you, rather you end up having to learn on the job through trial and error," Harvey said. "The hotel and beautiful Arizona weather were also very nice additions to the weekend!" A biennial process, Drum Corps International's Rules Congress allows corps instructors and designers to come together for the exchange of ideas on both the educational and competitive aspects of the drum corps activity. Two rules proposals were submitted for consideration prior to the winter meetings, the first aiming to create an "Entertainment Effect" caption as part of the adjudication process. According to the original submission, corps would be awarded points based on their "art of communication with the audience." Related content: Read the 2014 rules proposals in their entirety "Using the word 'entertainment' can be polarizing, but it also served as a catalyst for a very interesting discussion among the instructors, designers and adjudicators on how best to capture the overall value in a show's delivery to the audience," Madison Scouts Executive Director Chris Komnick said. "Our current system is awarding achievement in various caption categories, but it never specifically awards the total delivery—music and visual and continuity—of a corps' complete show." The original proposal was evaluated and discussed at length in the instructor caucus sessions on Friday and Saturday of the annual meetings. Common to the Rules Congress process, out of that debate came several alternatives that were revised and honed to maintain the spirit of the original proposal while refining the language to perhaps a more workable format for implementation. Komnick says that the original proposal was rescinded during the sessions in favor of backing a more broadly supported "Total Effect" concept that will still address points made in the original. "It's a pretty major step to recognize the value of an entire production and its connection to the audience," he said. Artistic Director Michael Cesario and DCI's Rules and Systems Task Force will return to work on the subject, evaluating the current judging sheets used to rank and rate corps performances with revisions and amendments incorporating the "Total Effect" approach. An official vote on adoption of the rule for the 2014 season has been scheduled near the beginning of March, allowing the model to be worked out under the current adjudication system with input from the corps. The second proposal addressed the instrumentation of a drum corps ensemble, recommending that any brass instrument, even those not traditionally considered to be of the "bell-front" variety as stipulated in the DCI rulebook be allowed in competition. "Similar to how a percussionist can play any percussion instrument including those which would be considered to be 'non-traditional' in a marching music setting, or to how guard members can manipulate any type of equipment or prop as a part of their performance, why not let the brass player play any type of instrument within the brass genome?" Komnick said explaining the intent of the proposal initiated by Madison Scouts Artistic Director James Mason. "This allows the musical palette to extend ever so slightly beyond its current boundaries." Approved in the instructors caucus and passed along to the voting membership for discussion and a vote, the proposal passed overwhelmingly. This is the first major change in brass instrumentation to affect the DCI rulebook since a proposal allowing "any-key" brass instruments was implemented in 2000. The rule will take effect with the start of the 2014 Drum Corps International season, but it is still to be seen if and how corps designers will take advantage of the opportunity to expand their playbooks to incorporate the different brass sounds now available. "I spend a lot of time during the season at contests studying the audience and adjusting my [musical] scores to achieve the maximum amount of effect and engagement," Santa Clara Vanguard Brass Arranger JD Shaw said. "If I were to put a trombone solo on the field and the audience hated it, I would change it. However, if I were able to make the audience love that moment, then we've created something new and exciting." In the meantime, lively debate among drum corps enthusiasts is sure to ensue, much as it has it has throughout DCI's more than 40-year history as "competition-legal" brass instruments evolved from one- to two- to three-valve configurations and from bugles in the key of G to more standard multi-keyed instruments. Also initiated through discussion as part of the Rules Congress—and set to be implemented for the 2014 competitive season—will be the reintroduction of a second percussion judge who will evaluate corps performances from the press box at select major regional events and the DCI World Championships. Utilizing more than one percussion judge is not a new concept, as they were previously used as part of the DCI judging system for several years in the mid-2000s. Cavaliers Percussion Caption Head Michael McIntosh spearheaded the proposal for revamped implementation during the weekend meetings in an effort to account for both the safety of the on-field judge and performing corps members in addition to musical considerations. "[The use of the second percussion judge] allows the intricacies and compositional detail between the battery and pit as well as the electronic design to be assessed from 'upstairs' as a holistic percussion ensemble," McIntosh said. McIntosh noted that the proposal, which was passed unanimously in both the instructors caucus session and by the voting membership, does not change or interfere with the role of the Music Analysis judge, and will serve as a way for adjudicators to more effectively judge the "total" music package.